Proxy Auto Checker - free and powerful solution for autoload and checking the lists of proxy servers. If you are looking to hide your IP address with a proxy, we can help! 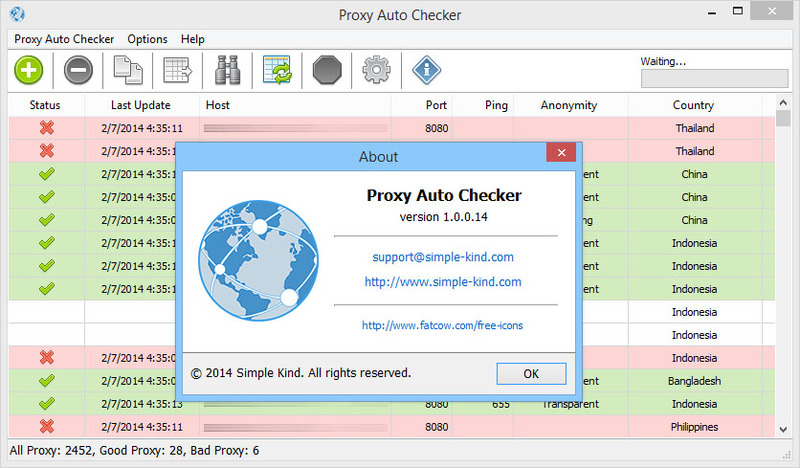 For automatic autoload and checking proxy list, we recommend this software. Using the Proxy Auto Checker software will allow a user to conveniently and anonymously surf the web without exposing their IP information. When your IP address is hidden with a proxy, you will not have to worry about other people - perhaps those with dubious intentions, like hackers or scam artists - using your IP address and running it through IP lookup tools to obtain your personal information. Load and combine proxies without checking. Load proxy list from file. Load proxy list from text. Download proxy list from the web. Check for anonymity - detect anonymous and high anonymous (elite) proxies. Using this straightforward application you can check the status of a proxy server and explore various details about them, such as host and ping. The main activity of the company - the protection of individual data and copyrights.